UFC 229: Battles, Drama, and a splash of Hypocrisy! On Saturday October 6th, 2018, we all witnessed what was a historic night for the UFC and the sport of mixed martial arts in general. Once the numbers are tallied, this will undoubtedly be the highest drawing pay-per-view to have ever been put together in the sport’s history, and it will take something clearly special to outshine it. That being said, I saw thing or two that put a damper on my experience, and the reactions to the drama which occurred immediately after the end of the main event certainly polarized fans and pundits. In order to put things in perspective, I’d like to talk about the Good, the Bad, and the Ugly of UFC 229. As a fight fan, I certainly was not disappointed by the combat that occurred, particularly during the main card. I saw some blood and guts performances from almost everyone, but let’s start with Derrick Lewis. One word for his miraculous, come from behind victory – WOW! Lewis just told everyone watching that if you sleep on him, even for a second, he will SLEEP YOU. That man has enough power in his fists to crumble the entire octagon, but instead decided to lay a nasty right hand on the chin of Alexander Volkov. To Volkov’s credit, he was doing exactly what he needed to in order to win the fight, but all it took was just one second for Derrick Lewis to dig deep and land an earth shattering bomb to end the fight. Props to the Black Beast, who will incidentally be fighting for the title at UFC 230 in a rather quick and unnecessary turnaround (more on that in another post). Better even than that was the unbelievable performance turned in by El Cucuy and Showtime. Can you say FIREWORKS?? Those two men were not about to hold anything back; they knew how important a victory at UFC 229 was, and that it would have major title implications. I actually believed that Tony would wipe the floor with Pettis, but Pettis impressed me with his resilience and veteran savvy, as he managed to knock down the former interim champion and even held dominant position for a bit. However, save for one lone blemish in his UFC career, Tony has always found a way to make his relentless pressure and creative striking shatter through his opponents’ game plans, and this fight was no different. He left Pettis a bloody mess and made sure that no one could forget where he stood in this division. The only real question is, will they reward him with the title shot that he SO deserves? Why Khabib…why?? Why did you have to ruin what was supposed to be a celebration by deciding to do an eagle impression off the top of the Octagon? As bad as Khabib’s actions were, for some reason they don’t quite disgust me as much as the reaction, particularly from Dana White, UFC announcers, and the media. All I heard from all of these parties was how “disgusting” it all was, and how it stained the sport that they’ve all worked so hard to legitimize. For Dana White, the man who deprives his fighters of proper pay, lashes out against his OWN champions (i.e. Tyron Woodley), forgoes proper matchmaking for interim title fights and WWE wrestler debuts, he is absolutely in no position to judge anything as “disgusting”. Remember, Conor McGregor threw a dolly into a bus window carrying fighters, and this resulted in some having to be pulled from the card. Glass went into the faces and eyes of people who had trained and worked hard for a very special event, and it could’ve been significantly worse. He broke the law by bringing his goons from Ireland to trespass on the Barclays Center in an effort to ambush Khabib before a title fight, and with all of the physical damage as well as property damage caused, the result was a bit of faux outrage from Dana White, minimal negative reaction from UFC announcers and media, a legal slap on the wrist, and McGregor being rewarded the biggest fight of his UFC career. For these people talk about how “disgusted” they are…the hypocrisy is blinding. It’s absolutely baffling how they think that Khabib is going to leave a stain on the sport that Conor (and Dana White) somehow already hasn’t. Conor McGregor is exactly what the sport shouldn’t be, but we’re all guilty of accepting him. We’re all guilty of putting our eyes to the screen when he’s on it, and we’re all guilty of condoning his ridiculous behavior. Dana White has absolved himself of all responsibility, even though he calmly laughed alongside McGregor and drank a glass of Proper 12 at the Radio City press conference as McGregor stoked the flame of a man who shows no mercy to his opponents. He gleefully watched as his PPV projections soared, turning a blind eye to the inevitable disaster brewing before he placed two fighters that genuinely hated each other in the Octagon. Of course, no blame on his cash cow McGregor; none at all. In fact, he seemed to speak in admiration as he said that McGregor wouldn’t be pressing charges, as though McGregor was just an innocent victim of his undisputed champion’s uncontrolled rage and violent outburst and took the noble high road. Khabib is having his purse withheld while, of course, McGregor’s is safely on its way. There is talk of Khabib and his teammates having potential visa issues in the future as a result of this mayhem, and yet, there was no talk of any of this when Conor decided to endanger the lives of fighters that had nothing to do with his beef. All eyes from the UFC view Khabib as the bad guy in this drama…as if we couldn’t somehow rationalize what the hell could’ve provoked him. But perhaps worst of all is that we may actually have to accept the fact that there may be an immediate rematch between Khabib and Conor, simply because McGregor called up his employee Dana and asked for it. I wouldn’t be surprised if it were granted, because Dana knows that it will be yet another cash grab. And hey, we’ll all watch. What happened after the main event at UFC 229 was ugly, but let’s never lose sight of the bigger picture here. The hypocrisy is evident, and should be called out any time it occurs. Sorry for the long hiatus; I have admittedly been quite lazy regarding my posts, but I figured, why not post about the return of EL CUCUY! At the upcoming UFC 229, we will be treated to yet another lightweight matchup, adding to the already stellar matchups of Diaz vs Poirier and Khabib vs McGregor. Enter Tony Ferguson in his return from devastating injury, which derailed yet another opportunity to face Khabib Nurmagomedov, in an unanticipated, but nevertheless, high-profile matchup against former champion Anthony “Showtime” Pettis, who just came off an impressive victory against fellow contender Michael Chiesa, in what appeared to be a return to form for the man who once cut through the division like a hot knife through butter. I’m sure that I can say with confidence that no one really anticipated such a quick turnaround for Tony Ferguson given the nature of his injury but, of course, Tony had to just prove us wrong with his insane mentality, work ethic, and hunger to get back in the octagon to do what he does best. I suppose it is characteristic of a champion to fight so hard in every respect to prove to both himself and the world that seemingly insurmountable obstacles are merely tests waiting to be passed by the truest warriors. The owner of a 10 fight winning streak, Ferguson will no doubt take this fight as an opportunity to show the world that no injury, regardless of the severity, can keep him from his place at the top of the mountain. He is arguably the most dominant, well rounded fighter in the division, and in every fight appears to show even more of his untapped arsenal, and fireworks may just be on the verge of bursting at UFC 229. However, in order to maintain his spot, he will need to stave off an equally hungry and motivated Anthony Pettis, a former champion whom most had written off as a has-been and shell of his former self in the USADA era. Indeed, since his lone title defense against Gilbert Melendez, he has had a rather rough go of things in the UFC, keeping fans waiting for the resurgence of the fighter once known to electrify the crowd with slick submissions and devastating striking abilities. That all seems to have changed with his victory of submission specialist Michael Chiesa, who Pettis incidentally defeated via submission. In a win that no one seemed to have seen coming, Pettis showed people that he is simply not a fighter to be slept on. Very few ever make it to the top by sheer luck, after all, and Pettis may only now be digging deep to reveal his true self – a dexterous and dangerous fighter with tricks in the bag that may just pop out when you least expect. Personally, I just think Ferguson will be too much for Pettis to handle, but that takes nothing away from my excitement regarding this bout. We have two hungry, former champions who are eager to reclaim what was once rightfully theirs, and this makes for an intriguing bout. Is Anthony Pettis ready for Tony Ferguson’s unorthodox style and relentless pressure? 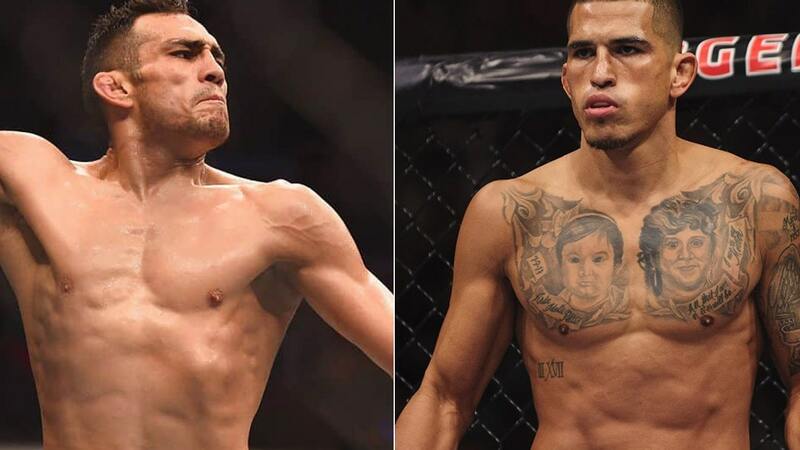 Is Tony Ferguson sleeping on Anthony Pettis, and unaware of what he brings to the table? These questions will be answered on October 6th, and I for one can’t wait to see what happens. We as fans cannot lose, but unfortunately, one of these guys will, so get ready for the action and don’t blink! I’m So Torn! Stipe…or Francis?? This may be the greatest heavyweight match-up put together by the UFC in years, and the first one I’ve been genuinely excited to see since maybe Cain vs Werdum. In that fight, we saw who was once a potential candidate for the greatest heavyweight of all time in Cain, and a Cinderella story in Werdum. As a UFC fan, I do love a good storyline, and much like those of Cain Velazquez and Fabricio Werdum, the storylines associated with Stipe Miocic and Francis Ngannou are so compelling that I find it so hard to root against either man. The thing is…who the hell do I root for? How can I not root for Francis Ngannou? In fact, how can ANYONE not be a fan of Ngannou after seeing what he has gone through up to this point? This man came from abject poverty, worked menial jobs with absolutely no one telling him that he could do more than what his environment expected of him. He decides to become a fighter at an age where most combat experts would deem him a senior citizen, and instead of crumbling as expected, decides to make his way into the UFC. All of a sudden, we have some new blood in the HW division, but who the hell is this guy anyway? Just another random addition to the somewhat shallow division, right? Is he going to make a splash? Well, I think we all know the answer to that question, considering he’s fighting for a title just 4 years into his professional MMA career. It would truly be the feelgood story of the MMA world if Francis made the impossible possible and defeated Miocic for the coveted belt. Whether you’re a fan of his or not, you’d have to agree that Ngannou would be an undoubtedly deserving and inspiring champion, and one who would put the entire division on its toes. So here I am…still debating on who I want to root for tomorrow. Maybe they’ll fight to a draw, and it’ll give me some more time and analytical ammo to see who I’d root for afterward. Then again…that sounds pretty stupid. I have a feeling that someone is going to be finished, and I predict here and now that if it’s a Miocic victory, it’ll be by 3rd or 4th round submission. However, the only way I see Ngannou winning is by KO; I don’t see him being able to do anything in this fight if Stipe drags him to the ground, and Ngannou will need to end the fight in the 1st round. Either way, we’re in for a real treat here. Best of luck to both men. Whoever wins, the fans don’t lose. I’m not sure exactly how to feel about Michael Bisping after his recent loss to Kelvin Gastelum. I’m not sure exactly how I feel about changing my mind about how I have ALWAYS felt about Michael Bisping. To give you an idea, the feelings that come to mind are rage, disgust, and pity…at least with regards to his out-of-the-cage personality. As a fighter, I can’t help but respect the fact that he’s one of the few true veterans of the sport that has stayed clean and has been up to the task of fighting anyone that the UFC puts in his way. However, I’ve realized that this respect quickly dissipates as soon as he opens his mouth for the very most part. Normally, Michael Bisping’s pattern of speech consists of sophomoric insults, trash talk without any hint of cleverness, and monologues bereft of any wit or intellectual prowess. He is, in so many ways, everything I despise about MMA. His cartoonish antics and complete lack of respect for most people in general leave such a bitter taste in my mouth that I have often felt that there is literally nothing he could do to earn my respect (to the disappointment of some of my fellow MMA enthusiasts and admitted Bisping fans). However, after seeing him get flattened by a fiery Kelvin Gastelum just a short period of time after he was submitted in front of millions of fans around the world, the only feeling I felt was sorrow. The immediate thought was “Man…this isn’t quite as satisfying as I thought it would be” (and, truthfully, satisfaction should not be something felt at the expense of another person’s physical and emotional harm. I’d like to think that, as a fan, I relish in the art of true, practiced combat between the greatest practitioners, as opposed to the sight of a man lying unconscious or having to deal with the emotional stresses of defeat on the world’s stage). I really did feel as though, despite Bisping’s general attitude, he earned true respect when he took a fight in order to save a main event that Anderson Silva nearly destroyed due to his most recent PED accusation. It was a a seemingly impulsive move that, unfortunately, led to the worst case scenario of his defeat and ultimate removal from title contention. Maybe he did it to redeem himself after losing his title to Georges St. Pierre, maybe he did it because he just felt the itch to fix his mistakes, or maybe he just did it because he loves to fight and can’t stay away from a challenge. It is this precise mentality that led him to his successful, last-minute title shot against Luke Rockhold, so perhaps he thought that another victory against a somewhat smaller middleweight was in his cross-hairs. Unfortunately, things did not turn out as planned, and he gave all the credit in the world to a very deserving Kelvin Gastelum, who had the performance of his career. Bisping made no excuses, took his loss on the chin, and thanked the crowd. This all just made me rethink my dislike for him…at least a little bit. He is both the consummate professional, and the childish douchebag you just wish would get punched in the face when he starts yammering on about whatever it is he enjoys talking about. He was a questionable champion in the eyes of many, and had a largely forgettable title run which ultimately ended at the hands of a career welterweight…and yet, no one will forget how he got that title – by taking on a prime champion, to whom he had lost previously on just 2 weeks’ notice. He is a buffoonish jerk, one not opposed to stooping to the lowest levels to get under an opponent’s skin (i.e. ripping up the Cuban flag in front of Yoel Romero, spitting in the corner of Jorge Rivera after defeating him, etc). And yet, he’s a family man, clearly a devoted father and husband who keeps his family, team, and friends in the front of his mind. He both humble and brash, bratty and surprisingly mature. He is the man that UFC fans love to hate, but then have never had the desire to take their eyes away from. I’ve always hate you Michael Bisping…but now, just a little less. Best wishes to you in the twilight of your career, and may you end with a win. Wow…Darren Till is ON THE MAP! If you have not seen the main event of UFC Gdansk, I highly recommend you either find it on YouTube or sign up for UFC Fight Pass, because you just missed an Upset of the Year candidate. Honestly, I wasn’t sure what to expect; in one of the least promoted cards of the year, on Fight Pass no less, we may have just seen the passing of the guard from a seasoned veteran in Donald Cerrone to a brash new contender in Darren Till, who was absolutely brimming with confidence from the moment he was given the opportunity of a lifetime. The premise was intriguing, and the matchup certainly spelled fireworks on paper, but still the question remained…was there to be anything unexpected here? The answer was a YES, which may as well have been broadcasted in neon lights and shouted on a megaphone. This was just unreal, and for all the right reasons. Let’s start with even how this matchup came about. Donald “Cowboy” Cerrone, long-time veteran of the UFC and perpetual fight seeker, has gained a reputation for staying unusually active over the course of a year. Not one to back down from challenges, he also proactively seeks opportunities to fight simply out of boredom. It’s really no surprise then that the former lightweight and currently ranked welterweight contender would, after a recent loss to former WW champion Robbie Lawler, want to get right back on the horse. As it turns out, he had just the opportunity waiting for him – a Fight Pass headlining opportunity in Poland against a relatively unknown, but fiery hot, undefeated prospect in a Muay Thai specialist from Liverpool, England. The upside for Cerrone? Not much; he gets to fight on a card with limited broadcast against someone who would not be able to bolster his standing in the division even with a dominant win. However, the real win for Cerrone was just being back in the Octagon and fighting in a place he had never been to. For him, it was just a vacation with some kicks and punches to be thrown in front of a crowd. Unfortunately, by seemingly treating this like a vacation, and by impulsively taking a fight against someone who he knew literally nothing about, he put himself into a predicament against a hungry young warrior who wanted nothing more than this very opportunity. Enter Darren Till. Darren Till, who is instantly appealing on the microphone with his cocky demeanor, simply oozes confidence every time he speaks. Particularly, he took a fight against a successful, 2-division contender who has proven to be dangerous in every aspect of the game, and expressed absolutely no doubt that he would annihilate this man. He not only KNEW he would knock out Cerrone, but also decided right away that he would be the greatest of all time. When you hear young, relatively unproven fighters say things like that, you can’t help but feel like they are in over their heads, especially when coming up against warriors that have run the gauntlet. Still, there was something about this kid…something that just made you want to believe that he had a shot against the same Cowboy who executed a picture perfect fight-ending combo against Rick Story, and knocked out the ever durable top-10 mainstay Matt “The Immortal” Brown. Darren Till came into the contest with the self-belief and bravado of a 100 fight veteran, and come fight time, I started to think to myself that perhaps this could be more of a fight than I had previously thought. It turns out that any doubts created by Till based on his previous UFC outings were quickly thrown out the window. In fact, you’d never even recognize Till as the same fighter; there was just something about his aura that spelled victory, and as soon as that bell rang, he quickly passed that message to Donald Cerrone. Till took over the center of the Octagon, demeanor as calm and relaxed as ever. Every single kick Donald Cerrone threw at him was caught and followed swiftly by a shake of the head, as if to say “Try again, son”. He stood in front of his foe, calculating his shots instead of swinging wildly as most might under the pressure of the headlining bright lights against a superstar. Every shot came with speed and ferocity and, soon enough, Darren Till would land a shot in the second half of the first round that would confirm his pre-fight prediction. He staggered Cerrone, and chased him to the cage with added shots that would ultimately crumble his already wounded opponent. Ladies and Gentlemen…Darren Till has OFFICIALLY arrived. Luke Rockhold, the former UFC Middleweight Champion, and current hot-headed contender on a warpath, hellbent on settling the score with his biggest adversary. The fact that anyone would ever think that GSP would be crushed by a fighter that is either in the middleweight or welterweight division is preposterous to me. Even if you think he’ll LOSE a fight, there’s no need for this kind of hyperbole. In Rockhold’s situation, I can see it as being more of an emotional reaction catalyzed by his longstanding bitterness following his loss to Bisping in 2016. Was it painful? Absolutely. Could it have been avoided? Of course! Does it eat Rockhold every second of the day? It appears to be that way. But is Rockhold being a bit ridiculous in his prediction, and could it perhaps be a statement motivated more by his visceral hatred of Michael Bisping? Yes, and YES. GSP has every tool to defeat Michael Bisping, and I do believe that he will take the crown from the aging champion. But there’s more to this than just Rockhold’s prediction; we need to dig deeper as to what actually justifies this event’s occurrence. Let’s call this fight what it really is: a spectacle. It is as much of an attempt to draw money as any superfight we’ve seen recently, and is part of an ongoing trend which has rubbed some the wrong way, while being encouraged by others as the new wave of the sport’s matchmaking. Bisping vs. GSP makes ABSOLUTELY no sense from a purist’s standpoint; we’re looking at a division in which the champion has yet to unify his title with a bout against the interim titleholder (Robert Whitaker, who just came off a scintillating victory over top contender Yoel Romero), and with plenty of able bodied, deserving challengers. Instead, we are given a former champion coming out of his retirement to cement his place in history. And that really is the key word…history. If the UFC has a chance to allow history to be made, along with a LOT of money, would they really pass up the opportunity in place of the ethical and sportsmanlike route of giving a deserving contender a shot? OBVIOUSLY NOT!! What Luke Rockhold and the others in this division need to understand is that this is a business as much as a sport, and upper management is not interested in anything other than PPV draws and draining their cash cows. Top contenders like Rockhold may get their chance, but only after the UFC has had its chance. For Rockhold in particular, I feel that the opportunity is not terribly far out of reach. He is still an outstanding fighter, a physical specimen, and more motivated than ever to get back his crown. If it takes a little bit of waiting, so be it – he can use the time to fix the holes in his game (i.e. his boxing) and then take what he believes to be his when the time is right. Until then, there’s just no point of him coming out and saying outlandish things that will get him nowhere. Now as a small disclaimer, I would like to let you know that I have taken a no-gi BJJ class once before, so this is technically my second class overall, but my first with a gi. I’ve actually had my gi for about 7 months, but just never mustered up the courage to throw it on and get on the mat. I’ve always been a bit hesitant to try new things, but I suppose it is human nature to fear things that you do not fully understand. Of course, I think it takes an entirely different kind of personality to volunteer yourself into a combative environment, especially with experienced grapplers. All that being said, I learned a few things that I felt were worth sharing. Firstly, I learned what I believe is a loop choke from your closed guard (which is a position in which you are on your back and your legs are interlocked around your opponent’s back so that you can limit his or her mobility). Essentially, the loop choke demonstrated is one of most complicated things I’ve ever seen done in a grappling exchange, and I can’t conceivably see myself using it in a real-time scenario until I’m quite experienced. It requires maneuvering of your opponent’s gi, and flawless execution. Nevertheless, it was quite the move to learn for my first time, and highly effective I might add. Secondly, I learned that it does not truly matter what level you are when you walk into a BJJ class; you will always be welcome. My experience is at the moment limited to the UFC Gym in Soho, but from everything I’ve heard from experienced practitioners and competitors, most BJJ gyms have quite a welcoming environment in which even beginners who have absolutely no exposure will be shown the ropes from more experienced classmates. There were no intimidation tactics, nothing that made it seem like I was a fish out of water. I was even lucky enough to have someone with experience go out of his way to walk me through the drills, and he did not once make me feel like I was slowing him down. As I gain more experience, I’ll be sure to pay it forward with a budding BJJ enthusiast that I may meet during one of these classes. Lastly, and perhaps most importantly, I was reminded that when you accept a challenge that you’ve presented to yourself, there is nothing quite as fulfilling. Granted, I’m at the very beginning of my BJJ journey, but one of the most challenging things about the initiation of this journey was actually getting myself to the gym and stepping onto that mat in the first place. It is so much easier said than done, and so glamorous in thought. BJJ is arguably the most important and necessary martial art to know and understand for any professional fighter. If you are defenseless on the ground, you are a guppy waiting to be fed to the sharks. To my point, just the thought of being choked into submission was incredibly nerve racking, but I knew I had to do this in order to make the proper strides in both my understanding of martial arts, and my need to overcome hurdles that are in front of me just waiting to my jumped. That is precisely why it felt so rewarding to cross the first threshold, and now I am confident that I will be able to further my learnings despite the fears that will remain. Can’t wait for the next new experience! The day I’ve dreaded for quite some time finally arrived…the day that confirmed the absolute worst scenario that I hoped could be avoided. Maybe I was deluding myself…maybe I just could not face reality. I suppose like most fans, I was simply caught up in the aftermath of arguably one of the most pivotal championship victories in UFC history. Alas, all the denial and delusion in the world cannot truly shield one from reality, which looms around the corner of every decision and action we choose to take. In this case, reality didn’t just set in – it came and hit me, along with many others I’m sure, like a Mack truck, and then the news today simply felt as though it rolled backwards to inflict just a little more damage. Today, Jon Jones has officially been confirmed as a multiple time steroid user, as the B-sample from his UFC 214 in-competition drug test came back positive. For me, this is probably the worst news I’ve received since hearing that Anderson Silva failed a drug test after his victory over Nick Diaz, following a long recovery after a gruesome leg injury after his bout with Chris Weidman at UFC 168. Seeing Anderson Silva lose was difficult enough; I was not yet ready to admit that Anderson Silva was not a mythical creature sent to us from the MMA gods to wreak havoc on his division in dazzling fashion. Seeing him lose AGAIN was even worse, especially given the brutal manner in which he lost, because I felt that I needed to admit to myself that perhaps the GOAT may have finally reached the end of his reign. However, I was more excited than ever after seeing Silva’s long road to recovery finally pay off in spades with a victory over one of the most notoriously aggressive fighters in MMA history in Diaz. Little did I know that this excitement would be short-lived once The Spider failed a drug test, and suddenly everything would change. I had always hoped that, despite everything we had seen with Jon Jones’ tumultuous career, he would ultimately reign supreme as the greatest light heavyweight of all time. Hell, I could even admit that Jones could have retired with a greater career than Anderson Silva, and he could have been one of the few champions to retire with his belt. When he defeated Daniel Cormier for the second time, I was just at the peak of my fandom. “What would be next for the champ? ?”, I excitedly asked myself. The sky was the limit…and the key word here is WAS. Now, we shall never know…and perhaps we will never know the reason that he just could not get out of his own way. He’s a professional fighter of the highest caliber, with a well-credentialed team of coaches and nutritionists by his side at every second. There is no excuse this time…there is simply no justification for a misstep of this magnitude. He has failed, and that’s that. I’ve been thinking about posting my thoughts about mixed martial arts for some time now, but I’ve been far too lazy to actually make anything happen. It could be that I’m so used to procrastinating that this rather unsavory trait has planted itself even into my actual interests. Nevertheless, I’m going to use this at my outlet to express my thoughts, opinions, and occasional insights. I am no expert, and I casually practice boxing and Muay Thai, but my goal is to expose myself to different martial arts, increase my knowledge of each, and incorporate my learnings into my writing. Hopefully, I’ll have enough readers that can enjoy my posts while also providing feedback to help me improve the content. So again, welcome to Hosh MMA, a blog for MMA fans, budding enthusiasts, and people who just like to read something that they haven’t before. I look forward to your responses!